The 10 Best Solar Flood Lights For Large Outdoor Areas. Source. Solar flood lights are one of the simplest options to reduce criminal activity around an area. It may be a home compound, a farm or a school, installing a good lighting system is assured to improve security. For most consumers, the decision to start using solar flood lights was probably the high cost involved with lighting up a wide area. Using floodlights connected to the national electricity grid may be expensive and erratic depending on the area hence the need for solar flood lights. Solar energy is clearly the better option for consumers despite the high initial set up costs. Consumer research has proven that these high costs incurred when adopting the unconventional power source is later offset by the substantial amount of money saved. One such utility is the solar flood light. Solar floods lights can be installed in any location regardless of the areas accessible to the national grid or traditional energy. The powerful LED lights and improved design ensures that the floodlight generates more than sufficient amount of brightness to allow the user to see clearly during night time. Below are some more benefits that can be gained by installing LED solar flood lights. Eliminates areas that can be used as hideouts in routes commonly traveled by pedestrians. Security lights remove potential areas that can be used by criminals to hide when waiting to waylay pedestrians. The light spreads over a wide area and leaves little in the dark. This provides added security for example around a house compound or around farm buildings. Provides facial recognition at a 30 feet distance. LED flood lights provide a lighting level that is closest to daylight allowing for increased visibility. The light produced gives the user facial recognition ability at a 30 feet distance. This means that a person can see almost every detail of their surrounding allowing them to recognize everything. Enhances the use of other safety devices in the area such as cameras. Solar flood lights allow the use of cameras for security at night by providing the required lighting for it to capture what is happening. 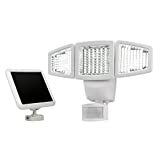 The solar LED flood lights can operate at a high powered light when motion activated to increase the camera’s capturing distance and increase its visibility and then switch to a lower light level for camera use. 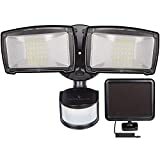 This ensures that the user can capture everything that happens at the specific location at all times including at night. Users may also combine the camera system and the solar powered flood lighting into one. Prevent crime in an area. This is probably the main reason why people install solar flood lights. Solar power continues working even when the power is out. Criminals usually operate at this time and having the area lighted up will deter criminal activity and even if a crime was to occur it would be easier to identify the perpetrators because of the good lighting. Increases night time activity and gives a feeling of security. The feeling of security was one of Maslow’s Hierarchy of needs. With a solar-powered LED floodlight the user can move closer to achieving this need. The added security also makes people more comfortable in continuing with their business even at night for example guards can patrol more frequently if an area has good lighting. The solar panel should be placed where it can get sunlight directly. The panel should not be hidden from sunlight during the daytime when it can charge. Before using the solar flood lights for the first time, it should be first be exposed to at least 6 hours of direct sunlight for enough battery stored power. The charge time is 6 to 8 hours in direct sunlight at a -20 to 60- degree temperature. 【3 INSTALLATION WAYS】SunBonar solar flood light can be setup with 3 ways: Mounted on the wall as wall light/garage light/garden light; Fixed with the ground spike as lawn light/landscape light/signage light. Mounted on the pole as patio light/pool light/driveway light. 【STURDY & WATERPROOF】IP65-rated waterproofing with sturdy aluminum casing, allows SunBonar Solar Lights Outdoor for optimal performance year-round and in all climates. 【OUTDOOR & INDOOR SOLAR LIGHTS】SunBonar solar flood light is available for both outdoor and indoor to cope with different usage scenarios. 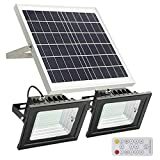 The best solar lights for doorway, backyard, garage, driveway, deck, patio, shed, court, swimming pool, billboard, porch, corner. 【WHAT YOU GET】SunBonar Solar Flood Light, 6 watts solar panel with 16.4 feet cable, ground spike, mount screws, instruction manual, and our worry-free 14-month warranty and 7*24 friendly customer service. 1. 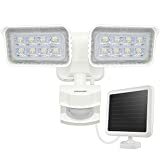 MAYSAK Solar outdoor PIR motion sensor lights, with waterproof amorphous silicon solar panel charges in all daylight conditions, does no need direct sunlight more suitable for the occasions with weak-sunshine. 2. MAYSAK Solar powered security lights used newest exclusive self-developed infrared human body sensing technology of detection reaching 25 meters long-range and elimination animal erroneous firing without error triggering. 3. This front door solar security lights built-in 60pcs ultra bright LED output 750 Lumens brightness, built-in 5pcs 1.2V 900mAh AA batteries supply powerful electricity and provide longer lighting time. 4. 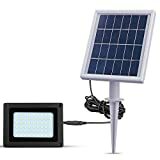 This outdoor garden fence security light absorbs and converts the sunlight into electricity in daytime then stored to the built-in rechargeable battery, will light up for 10-120 seconds (Adjustable) when motion detected at night and the switch in "Auto" mode. It will prolong lighting time if motion detected once again during lighting until you leave the detection area, also you can turns the which to "ON" it meets your need to for long time use. 5. All the MAYSAK's products are well packed in a box with our owner brand, please check whether it's the exclusive packaging with "MAYSAK" trademark when you receive the items and we will offer 1 year warranty. please feel free to contact us for support or replace product during this time. [Max Illuminate area up to 16ft x 25ft for each lamp ]:You can put these two lamps together to Illumination zone or seperated them into different area as you wish. Dusk to Dawn Available:This solar flood light will turn on at dusk and turn off at dawn automatically when it is on "Auto" Mode. The remote distance is 16.4ft. Long Working Time: The solar flood light with remote equipped with 6V/18W solar panel to charge the built-in 3.7V/8800mAh Li-ion battery which will provide up to 8-12 hours of continuously lightning after a day of full charge. Ultra Bright: The solar remote light is far brighter than other similar lights.With 126Pcs SMD Leds,it provides up to 800Lumens brightness. Easy installation:Adjustable wall mount bracket,you can install it either on a wall and use it as security light or place it on the ground as landscape light. No AC or DC power is needed. 3W/6V SOLAR PANEL:Can charging in cloudy weather,4000mAh, 3.7V Rechargeable Lithium-ion Battery Providing an average of 8-10 hours continuous illumination time with full charge from dusk to dawn. With solar panel, it can convert up to 17% of the sunlight into electricity energy. 【INCREASE 30% BRIGHTNESS WITH NANO-PLATING REFLECTOR】 SunBonar Solar Flood Light is much brighter than other similar outdoor solar lights in the market, as it equipped with nano-tech reflector, which increase 30% brightness without power dissipation. 【10-12 HOURS DUSK-TO-DAWN SOLAR LIGHTING】 SunBonar Solar Flood Light contains a 8000mAh big capacity battery, and matches with a unique designed overcharge & overdischarge protection circuit, which enable the battery to input & output power efficiently in it's 3-5 years lifetime. 【WATERPROOF SOLID DIE-CASTING METAL HOUSING】Equipped with high quality die-casting aluminum and waterproof design allows SunBonar Solar Lights Outdoor for optimal performance year-round and in all climates. 【AVAILABLE FOR OUTDOOR & INDOOR LIGHTING】 With 16.4 feet cable and upgraded light sensor, SunBonar Solar Flood Light is available for both outdoor and indoor to cope with different usage scenarios. Perfect for using on Front Door, Backyard, Garage, Driveway, Deck, Patio, Shed, Pool, House etc. 【WHAT YOU GET】SunBonar Solar Flood Light, 10 watts Mono solar panel with 16.4 feet cable, mount screws, instruction manual, and our worry-free 14-month warranty and 7*24 friendly customer service. SOLAR POWERED & ENERGY SAVING: The solar lights is 2 super bright LED light, produces up to 1500lm brightness output and have a good heat dissipation. Built-in 3000mAh Lithium-ion battery, which is rechargeable by amorphous silicon solar panel with 15 Ft cord. No need for electricity, environmental friendly product. compare with polysilicon solar panel, our amorphous silicon solar panel still can obtain low current charging in the cloudy/rainy days or in areas where sunlight is insufficient. IP65 WATERPROOF: IP65 waterproof rating ensures that your 2 head security light fixture won't give in in rain, sleet or snow weather. Perfect for Entryways, Stairs, Yard, workshops, and large area lighting requirements. HIGH SENSITIVITY & ADJUSTABLE DESIGN: Up to 180°wide sensing angle and max 49ft sensing range. Easy to adjust the light heads and motion sensor to different angle as your requirement. DURABLE & LONG-LASTING: With an long life rating of 50,000 hours, lasting and consistent in good performance. It's outstanding quality standards provide efficient lighting and adds extra safety for your house. LEPOWER WARRANTY: 1 year warranty, 60 days money back guarantee for quality problem. Please feel free to buy. Remote Control Available:You can control the brightness(30% 60% 80%) and working time(1H-8H) of the two lamps by one remote controller.The remote distance is 16.4ft. Light Sensor: The remote solar flood lights can turn on at dusk and turn off at dawn automatically when it is on "Auto" Mode. Long Working Time:The solar flood light with remote equipped with 6V/15W solar panel to charge the built-in 3.7V/6600mAh Li-ion battery which will provide up to 8-10 hours of continuously lightning after a day of full charge. 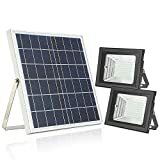 Flexible Mounting:The solar flood light has two extension cord from the solar panel that allow you put these two lamps together to Illuminate outdoor/indoor zone or seperated them into different area as you wish. 【Weather Resistant Flood Light】The Outdoor lights made of durable cast aluminum,durable enough to resist rainy day or any other bad weather ,Never mind this solar light will be break when meet these conditions. 【Three Option Motion Sensor Light 】Auto ON/OFF solar sensor light with three option 30s,60s,120s when motion active turn on the outdoor light at night and off at dawn,energy saving and money saving. 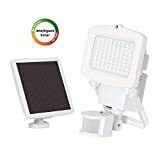 Solar-Powered & Energy Saving: With dual adjustable head, this led security light is solar-powered, produces up to 950 lumens super bright light and good heat dissipation. Using 1500mAh lithium-ion rechargeable battery, no more need electricity and save your electricity bill. The amorphous silicon solar panel is with 15 ft cord and separate from the light. Please put the solar panel in a place where sunlight is sufficient and available. Motion Sensor & Adjustable Design The solar motion light provide maximum of 180 degree sensing range and up to 49ft sensing distance. Both light heads are easy to move and adjust, the PIR sensor head is flexible for different angles to satisfy your needs. Please make sure there are no other ambient ray/ infrared light around the solar light.